As the saying goes, we must never judge a book by its cover and these words of wisdom couldn’t be truer when it comes to choosing a care community for our aging relatives. The quality of care a facility can provide isn’t something you can easily determine just by looking at the community grounds and noticing how green the lawn is, or stepping into the facility’s lobby and being amazed at the interior design. There are a number of factors you must consider to determine if the facility is the right fit for your loved one. Common and living spaces are one of the factors that you should pay attention to when touring a senior care facility. Are staff members pleasant and welcoming? Can you imagine your parent or grandparent spending their time there and enjoying it? Are there plants and appropriate decor? Are engaging recreational facilities available and easily accessible to residents? Do residents look well-cared for? Are the various areas well-kept and orderly? Take note of how clean and well-maintained the common areas and living spaces are. If any sights, smells, or sounds make you feel uneasy, be sure to voice your concerns to a tour guide or a staff member. While it could be a one-time problem, there’s also a chance that it could be a part of larger, more serious sanitation issue. To ensure the facility is properly maintained, it is imperative that you question the staff about the facility’s conditions until you are completely satisfied with their explanation. If your loved one is using a wheelchair, it certainly helps to choose a facility with spacious rooms and corridors that can easily accommodate them. Nutrition contributes to a person’s health and well-being. When touring a facility, be sure to take a look at the dining area. If possible, sit down with your loved one for a meal so you can experience the facility’s dining ambiance and get a taste of their cuisine for yourself. Pay attention to the quality of food, taking note of its nutritional value. 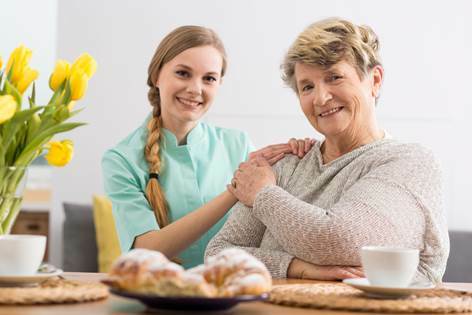 If you can’t imagine yourself eating the food the facility serves and spending some time in their dining area, then it probably isn’t a good idea to subject your aging relative to the same experience. Also, don’t forget to ask the tour guide if the facility takes into account a resident’s dietary restrictions or if they provide menu alternatives. When touring a senior care facility, the current residents are usually your best resource, as demonstrated by residents of CareOne facilities. Since they are the ones who live at the facility and utilize everything it has to offer, their first-hand account can be quite valuable and can help you decide if a prospective facility is indeed the right fit for your loved one. Further, don’t base your decision entirely on the information offered by the tour guide. If possible, engage with residents to discuss their experience and be sure to ask them if they are enjoying their current community. Are there things they don’t like about the facility and its staff? If there are, find out why they dislike those things. Also, consider taking part in an activity on the day of your visit. Pay attention to the turnout and level of engagement. One of the most important things to take into consideration is how the staff treats the residents. Positive interaction with the caregivers is essential to improving the seniors’ quality of life. Therefore, as soon as you walk into the facility, observe how the staff members treat and interact with you as well as the residents. Are they welcoming or attentive? Are they bright and cheery? Are they treating the seniors with the utmost care and respect? The staff’s treatment towards both visitors and current residents should set the standard for the facility. Take the time to talk to the staff members and care providers. Ask them about their work experience, and find out if they are satisfied with their current jobs and work environment. Always remember that happy and satisfied employees are less likely to abuse and disrespect the residents under their care. Finally, have a chat with the current residents and have them rate the care that they are currently receiving. If they are happy with their care providers, it’s very likely that you’ll get a very enthusiastic response from them. Also, observe how they interact with their caregivers. See if they are familiar and friendly towards each other. By taking these matters into consideration, you’ll be able to discern the facility’s level of commitment to providing comfort, care, and safety to their residents, while enhancing the quality of their lives. These factors, in turn, will help you and your loved one make an informed decision when it comes time to move into a facility. If you have loved ones who are in need of a senior care facility, feel free to get in touch with our team to discover ways CareOne can help you and your loved ones live life to the fullest. Interested in learning more about the senior care industry for a family or loved one? Visit the Daniel E. Straus blog for more information.